This week, the sages play upon a single word to discover – or is it release?! – meaning from the passage at hand. But first of all, the question must be, what is the question they are struggling with? The question at hand is rarely stated explicitly; sometimes it is obvious, and more often it is far more difficult to discern. I will begin with my best guess as to what the question is, then share their attempts to resolve and illuminate the passage, and finally share my own thoughts about a very different resolution of the same problem. The problem revolves around the Hebrew word haruth, which means something like "etched" or, as Rashi tells us, "cut into." That the Sages don’t like this word is clear, but what is their problem? It helps to recall the setting: Moses is about to descend from Mt. Sinai with these first set of tablets, where he will discover the people dancing in front of the Golden Calf, and it is these tablets, "haruth" by the hand of G!d, that he will destroy. So nu? Shouldn’t the fact of the tablets’ demise be more important than how they were created? I think the problem has to do with the problem with "graven images," forbidden to us. Can the Holy One be in the business of making graven images? Or would we, given something engraved by G!d, come to worship it as an idol? R. Joshua b. Levi said: A heavenly voice issues from Mount Horeb every day, saying: ‘Woe unto those creatures who neglect the study of the Torah.’ For whosoever studies not the Law continually is rebuked by God; as it says, and the tablets were the work of God, and the writing was the writing of God, graven (haruth) upon the tablets (Exo. 32:16). What is the meaning of haruth? This was discussed by R. Judah, R. Jeremiah, and the Sages. R. Judah said: Read not haruth (graven), but heyruth (free) from captivity. R. Nehemiah opined that it means free from the Angel of Death; whilst the Sages were of the opinion that it means free from suffering. The Sages change "engraved" to "freed from," and then speculate about what it is that Torah frees us from: is it from captivity, like the slavery of Egypt? Or is it freedom from death, as in meriting a place in either Olam Haba, the World to Come, or at the coming of the Messiah, may it be swift and in our day? Or does it simply mean that the Torah frees us from suffering? How can Torah free us from captivity? There is an epithet – meaning, another name for – Jews who have lost touch with their Judaism: they are referred to as the "captive children of Israel." In other words, they have been "captured" by the world, and must be "freed" from that captivity. In that sense, studying Torah indeed frees us from captivity. Does Torah free us from death? The danger to answering "yes" to this is that it could be taken to imply that the penalty for not studying Torah is death. 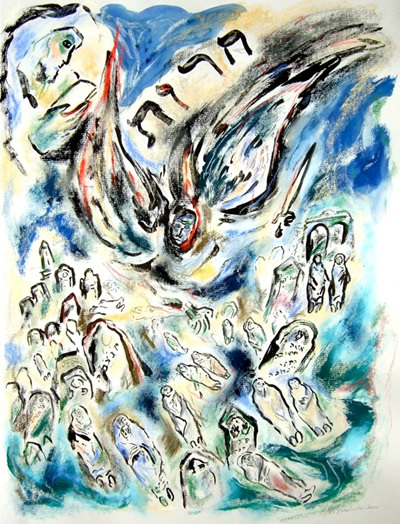 The only way that a "yes" to this question makes sense to me is that Torah is one of many ways to achieve a personal connection with G!d, and that any such connection – by any means, whether by Torah or not – revives our spirits. As for Torah freeing us from suffering, alas, there are far too many today who, G!d-forbid, suffer, whether they are students of Torah or not. But I can tell you that in those moments in which I am able to immerse myself in the study of Torah, for those sweet moments of time, whatever suffering I am enduring lifts. So, in a sense, Torah can free us from suffering. Now, as I told you, I think there is another meaning to the "freedom" of the creation of the tablets. Think about the process by which a sculptor creates: we are told, especially in the case of truly talented artists, that they take a block of stone, clay, or whatever, and simply “remove” what does not belong to the finished work. They “free” or “liberate” the work from its encasing media. So, in a sense, G!d “freed” the words from their encasing stone. But I think we can take it even deeper. We have been taught, rightly so, that the words of Torah are living, alive for us this day. Every time we study Torah, we are given the chance to learn something new, something that never was there for us before. It is in this sense that the Torah itself must be free of the rigid constraints we might, in error, attempt to place upon it. Indeed, we must free those living words from a fixed, stone-like interpretation, and breathe life to them with our actions so that we – and they – can be alive to the world around us. This is, for me, one more way in which G!d created words of Torah by "freedom," not "engraving." May we each be blessed with many opportunities each day to see how those words can live in our lives, and breathe life into others. Many of us have heard the lesson that all Jews were present at Mount Sinai when the Torah was given – created or not yet created. This, in itself, creates an interesting paradox. R. Isaac said: The prophets received from Sinai the messages they were to prophesy to subsequent generations; for Moses told Israel: But with him that standeth here with us this day before the Lord our G!d, and also with him that is not here with us this day, etc. (Deut. 29:14). It does not say ‘that is not here standing with us this day,’ but just ‘with us this day:’ these are the souls that will one day be created; and because there is not yet any substance in them the word ‘standing’ is not used with them. Although they did not yet exist, still each one received his share of the Torah, including Malachi and Isaiah. Not only did all the prophets receive their prophecy from Sinai, but also each of the Sages that arose in every generation received his wisdom from Sinai, for so it says, These words the Lord spoke unto all your assembly… with a great voice, and it went on no more. (Deut. 5:19). R. Johanan said: It was one voice that divided itself into seven voices, and these into seventy languages. R. Simeon b. Lakish said: It was the voice from which all the subsequent prophets received their prophecy. The Sages said: It had no echo. As to the view of R. Johanan, the following verse supports him, for it says, The Lord giveth the word; they that proclaim the tidings are a great host (Ps. 68:12). Consider the first two points: G!d’s Voice is heard by each of us in the language (tongue) best suited to us. What a compelling case for the strength of diversity this makes! You and I each get to share in the Divine One’s wisdom (and other blessings), even though what I receive seems completely foreign to you! The third point amplifies this, and brings it into the present: when we speak with wisdom, we are speaking the words / things we heard before we were conceived! How awesome, to think that the words that leave our mouths can have their direct source at Sinai! And what a responsibility for laShon haTov (good speech) that creates! Think about echoes – what relationship do they have to their source? They sound similar, but they are diminished in power, and ultimately fade. They also "bounce" off solid objects, and seem to come to us from a very different direction than the source. So, it seems to me, it is with G!d’s wisdom. It is never diminished, encounters no obstacles, and never comes from the "wrong" direction. But that is just my interpretation – what do you think? Leave a comment and let me know! 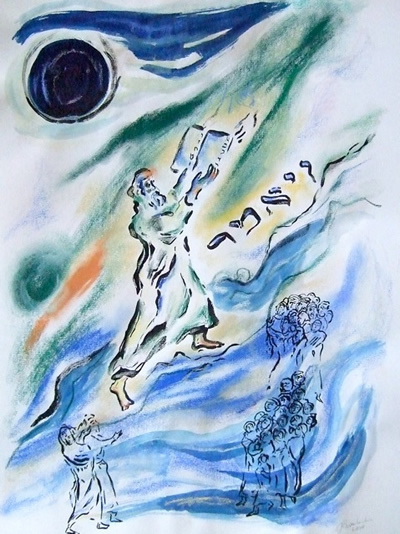 This week’s portion, Devarim, begins with an odd construction: “Eileh ha-devarim asher diber Moshe…” meaning generally, “These are the words (things) that Moses spoke…” What makes this unusual is that the verb would normally “amar.” The Rabbis inferred from this that, since the root DBR (word) is doubled, it means “strong words.” What kinds of words are “strong?” Words of rebuke, they reasoned, thereby creating a puzzle to be solved (or perhaps solving another, earlier puzzle): Why would Moses begin his discourse by rebuking all Israel? After all, here we are, about to hear his last words before he is taken from us and we must go it without our faithful leader, and he starts by rebuking us? How does this motivate us? There are many deeper lessons here; let’s start with what the Midrash tells us. 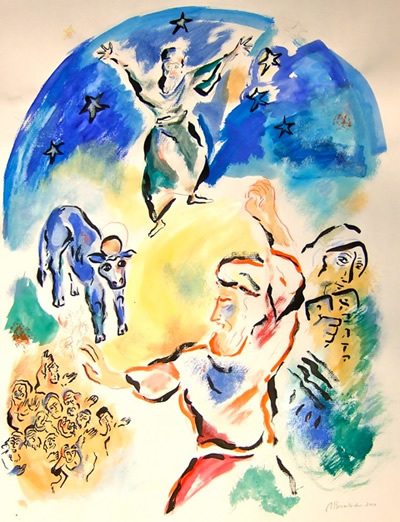 Midrash Rabbah Devarim I:4 notes this problem, and further notes that Balaam had blessed Israel (the earlier puzzle), and then wonders: aren’t things reversed? Shouldn’t Moses bless Israel, and Balaam curse us? No, the rhetorical answer comes: if it were that way, then who (amongst the other peoples) would believe the blessings, since they come from a friend? And who (amongst the Israelites) would take the rebukes seriously, since they come from an enemy? Instead, people will more likely listen to what seems to come from a source without bias or a hidden agenda. And so we have illuminated for us the conundrum of belief: we believe what we want to hear, but we are more likely to receive the unexpected as true. It is the unexpected that shakes us out of complacency, the strange that gets our attention; we notice what is different, not what is the same. Once noticed, we work diligently to make the “different” the “same,” to make the strange unremarkable. It is the fundamental process of learning: noticing the unexpected, and making it predictable. So Moses could have told us what we wanted to hear: “It’s going to be fine, everything will be all right, don’t worry, it’s the land of milk and honey – what could go wrong?” Instead he delivered the message we needed, as only he could: “Shape up! I know you all, and how easily you stray! Don’t get complacent – stay alert!” Strong words, indeed – strong words to impart strength.